There is so much emotion throughout the day of a wedding. While friends and family gather to watch their loved ones take this huge step in life, there are always many thoughts and memories that go through their minds on this happy occasion. Wedding ceremonies are especially emotional for some people. The bride being escorted down the aisle by her father, the smile on the groom’s face as he sees her for the first time…these are just some of the events that occur in during the ceremony that can move people to tears. What’s even more moving is seeing the reactions of the guests and bridal party when they see the moments unfold. 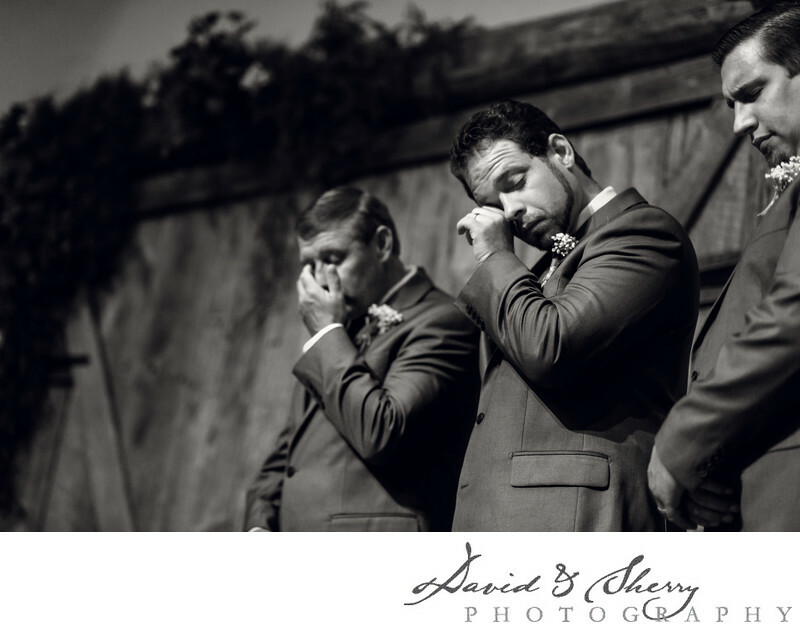 This candid shot of the groom’s father and two brothers is full of raw emotion. These three groomsmen were moved as they watched their youngest son and little brother tie the knot with his beautiful bride. As the minister said a prayer, these men stood side by side at the front of the church and wiped tears away. It is a wedding photographers job to document these moments for the bride and groom to look back on; moments that they may not have noticed as they were happening. The most precious and meaningful photos taken on a wedding day are the ones that portray feeling and expression.